Times of India – BENGALURU: Afghanistan ‘s dreams of scripting a fairy-tale turned into a virtual nightmare as a ruthlessly professional India demolished them by an innings and 262 runs inside two days to win the historic one-off Test match here. 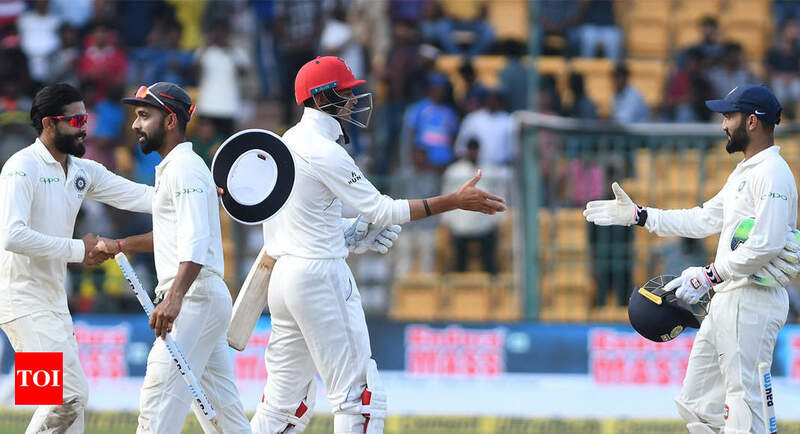 BENGALURU: Afghanistan ‘s dreams of scripting a fairy-tale turned into a virtual nightmare as a ruthlessly professional India demolished them by an innings and 262 runs inside two days to win the historic one-off Test match here. Their performance lends support to the demands for a two-tier Test format, which could get them battle-ready for future series. Once the top-order was blown away by Umesh and Ishant, Ashwin and Jadeja made short work of the middle and lower-order as the second day turned into a totally mismatch.There were two minor milestones for India.